Discussions Magazine Music Blog: An EXCLUSIVE Interview with RODRIGUEZ! 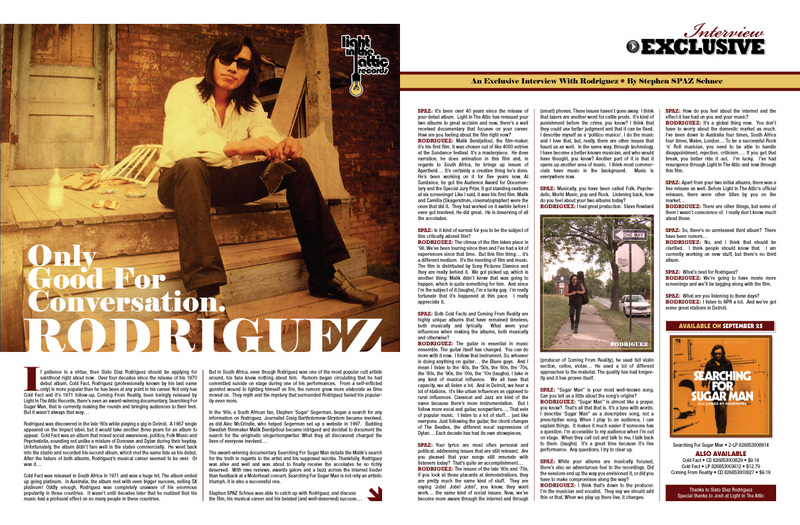 An EXCLUSIVE Interview with RODRIGUEZ! Cold Fact was released in South Africa in 1971 and was a huge hit. The album ended up going platinum. In Australia, the album met with even bigger success, selling 5X platinum! Oddly enough, Rodriguez was completely unaware of his enormous popularity in those countries. It wasn’t until decades later that he realized that his music had a profound effect on so many people in these countries. But in South Africa, even though Rodriguez was one of the most popular cult artists around, his fans knew nothing about him. Rumors began circulating that he had committed suicide on stage during one of his performances. From a self-inflicted gunshot wound to lighting himself on fire, the rumors grew more elaborate as time moved on. They myth and the mystery that surrounded Rodriguez fueled his popularity even more. The award-winning documentary Searching For Sugar Man details the Malik’s search for the truth in regards to the artist and his supposed suicide. Thankfully, Rodriguez was alive and well and was about to finally receive the accolades he so richly deserved. With rave reviews, awards galore and a buzz across the internet louder than feedback at a Motorhead concert, Searching For Sugar Man is not only an artistic triumph, it is also a successful one. SPAZ: It’s been over 40 years since the release of your debut album. Light In The Attic has reissued your two albums to great acclaim and now, there’s a well received documentary that focuses on your career. How are you feeling about the film right now? RODRIGUEZ: Malik Bendjelloul, the film-maker, it’s his first film. It was chosen out of like 4000 entries at the Sundance festival. It’s a masterpiece. He does narration, he does animation in this film and, in regards to South Africa, he brings up issues of Apartheid… It’s certainly a creative thing he’s done. He’s been working on it for five years now. At Sundance, he got the Audience Award for Documentary and the Special Jury Prize. It got standing ovations at six screenings! Like I said, it was his first film. Malik and Camilla (Skagerstrom, cinematographer) were the ones that did it. They had worked on it awhile before I even got involved. He did great. He is deserving of all the accolades. SPAZ: Is it kind of surreal for you to be the subject of this critically adored film? RODRIGUEZ: The climax of the film takes place in ’98. We’ve been touring since then and I’ve had a lot of experiences since that time. But this film thing… it’s a different medium. It’s the meeting of film and music. The film is distributed by Sony Pictures Classics and they are really behind it. We got picked up, which is another thing: Malik didn’t know that was going to happen, which is quite something for him. And since I’m the subject of it (laughs), I’m a lucky guy. I’m really fortunate that it’s happened at this pace. I really appreciate it. SPAZ: Both Cold Facts and Coming From Reality are highly unique albums that have remained timeless, both musically and lyrically. What were your influences when making the albums, both musically and otherwise? RODRIGUEZ: The guitar is essential in music ensemble. The guitar itself has changed. You can do more with it now. I follow that instrument. So, whoever is doing anything on guitar… the Blues guys. And I mean I listen to the ‘40s, the ‘50s, the ‘60s, the ‘70s, the ‘80s, the ‘90s, the ‘00s, the ‘10s (laughs). I take in any kind of musical influence. We all have that capacity, we all listen a lot. And in Detroit, we hear a lot of stations. It’s like urban influences as opposed to rural influences. Classical and Jazz are kind of the same because there’s more instrumentation. But I follow more vocal and guitar, songwriters…. That vein of popular music. I listen to a lot of stuff… just like everyone. Just following the guitar, the chord changes of The Beatles, the different vocal expressions of Dylan… Each decade has had its own showpieces. RODRIGUEZ: The issues of the late ‘60s and ‘70s, if you look at those placards at demonstrations, they are pretty much the same kind of stuff. They are saying ‘Jobs! Jobs! Jobs!’, you know, they want work… the same kind of social issues. Now, we’ve become more aware through the internet and through (smart) phones. These issues haven’t gone away. I think that tazers are another word for cattle prods. It’s kind of punishment before the crime, you know? I think that they could use better judgment and that it can be fixed. I describe myself as a ‘politico musico’. I do the music and I love that, but, really, there are other issues that haunt us as well. In the same way, through technology, I have become a better known musician, and who would have thought, you know? Another part of it is that it opens up another area of music. I think most commercials have music in the background. Music is everywhere now. SPAZ: Musically, you have been called Folk, Psychedelic, World Music, pop and Rock. Listening back, how do you feel about your two albums today? RODRIGUEZ: I had great production. Steve Rowland (producer of Coming From Reality), he used full violin section, cellos, violas… He used a lot of different approaches to the material. The quality has had longevity and it has proven itself. SPAZ: “Sugar Man” is your most well-known song. Can you tell us a little about the song’s origins? 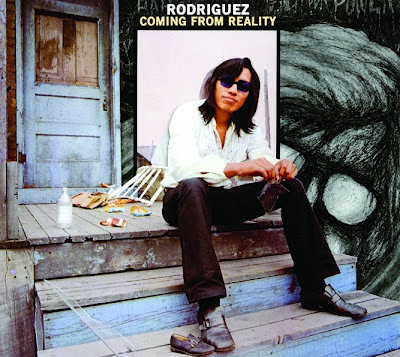 RODRIGUEZ: “Sugar Man” is almost like a prayer, you know? That’s all that that is. It’s a tune with words. I describe ‘Sugar Man” as a descriptive song, not a prescriptive song. When I play to an audience, I can explain things. It makes it much easier if someone has a question. I’m accessible to my audience when I’m out on stage. When they call out and talk to me, I talk back to them. (laughs) It’s a great time because it’s live performance. Any questions, I try to clear up. SPAZ: While your albums are musically focused, there’s also an adventurous feel to the recordings. Did the sessions end up the way you envisioned it, or did you have to make compromises along the way? RODRIGUEZ: I think that’s down to the producer. I’m the musician and vocalist. They say we should add this or that. When we play up there live, it changes. SPAZ: How do you feel about the internet and the effect it has had on you and your music? RODRIGUEZ: It’s a global thing now. You don’t have to worry about the domestic market as much. I’ve been down to Australia four times, South Africa four times, Wales, London… To be a successful Rock ‘n’ Roll musician, you need to be able to handle disappointment, rejection, criticism…. If you get that break, you better ride it out. I’m lucky. I’ve had resurgence through Light In The Attic and now through this film. RODRIGUEZ: There are other things, but some of them I wasn’t conscience of. I really don’t know much about those. RODRIGUEZ: No, and I think that should be clarified. I think people should know that. I am currently working on new stuff, but there’s no third album. SPAZ: What’s next for Rodriguez? RODRIGUEZ: We’re going to have movie more screenings and we’ll be tagging along with the film. SPAZ: What are you listening to these days? RODRIGUEZ: I listen to NPR a lot. And we’ve got some great stations in Detroit.